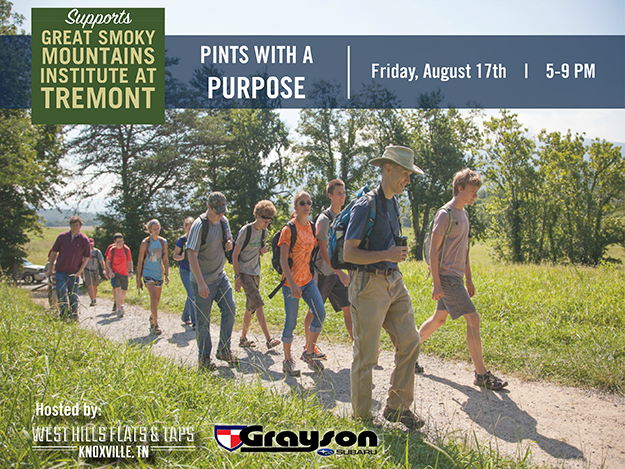 KNOXVILLE — Great Smoky Mountains Institute at Tremont is partnering with Grayson Subaru and West Hills Flats and Taps for “Pints with a Purpose,” an event benefiting Tremont’s scholarship fund. This free event has live music, a great menu of flatbreads, and a wide selection of craft beer. Blackberry Farms Brewery is sponsoring the event. Proceeds from the event go to scholarships for students to attend Tremont Institute’s outdoor education programs. This unique experience allows students to live and learn in Great Smoky Mountains National Park. For many students, it is their first experience in a national park. The event takes place at West Hills Flats and Taps in Knoxville on Friday, August 17. The event kicks off at 5:00 pm and closes at 9:00 pm. No registration is required. Admission is free. “Pints with a Purpose” is possible because of the support and careful planning of West Hills Flats and Taps and Grayson Subaru. We are grateful for their enthusiasm, generosity, and passion for Tremont’s mission. Come join us as we celebrate connecting people with nature with a terrific group of community supporters,” says Laura Beth Denton, marketing and technology coordinator of Tremont Institute. Tremont Institute was founded in 1969 in cooperation with the National Park Service. Today, Tremont serves more than 6,000 students, teachers and adults annually. Tremont’s mission, “Connecting People and Nature,” is fulfilled by hands-on education experiences that celebrate ecological and cultural diversity, foster stewardship of natural resources, and nurture appreciation of Great Smoky Mountains National Park. Tremont partners with schools in more than 30 states, and with numerous universities and environmental organizations in providing experiential education and conducting research. The organization is funded by program fees, research grants, sponsorships, and private giving.